I love spinning. There’s something so relaxing about yard after yard of gently twisted fiber slipping over my fingers. It just speaks of peace... reflection... harmony... Too bad the finished single isn’t always as wonderful as the spinning experience! Plying can help cover a myriad of accidents. 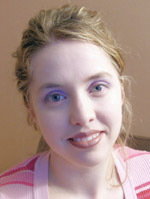 By twisting two singles together, it’s possible to even-out variations, hide a bit of over-twist, or disguise slubs. Besides the cosmetic benefits, plying makes the resulting fiber stronger and less likely to break when tension is applied. It also reduces the exposed surface area of the individual strands which makes them more durable and less likely to pill. Plying prevents handspun yarns from biasing. Bias is the “lean” stitches have when the twist energy of the single causes the stitches to appear slanted in the finished piece. The slant is caused by the individual loop of each stitch attempting to twist around itself. It’s prevented by the loop of the stitch above it, and so it leans, due to the semi twisted state. While biased yarns can be used in knitting to achieve a certain affect, most knitting is better suited to a nicely balanced yarn. If you’re a new spinner, you may not have attempted plying yet. It’s not hard, but it is different than spinning a single. If you’re struggling, keep reminding yourself that you’re learning something new and it may feel odd or difficult until you’ve memorized the technique. If you’re more experienced, read on. You’ll probably learn something new or at least refresh your memory. If you have a tensioned lazy kate, use it. It will prevent your bobbins from rolling and tangling on the floor. The smoother this operation goes the better. Don’t have a tensioned kate? Look here for instructions to create your own for about $6. Another good option is to wind your singles into center pull balls and set one on each side of you. Here’s a good video for hand-winding center pull balls; an empty paper towel or toilet paper roll can be substituted for the nostepinne. You can leave your singles on the bobbin and place them on an untensioned kate or on the floor. This method is the hardest to control and causes tangles. Take a few minutes to wind the center pull balls – it makes a world of difference in the finished yarn. Before you even begin, check your leader. 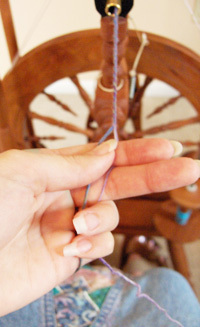 The easiest plying starts on a sturdy leader with a loop at the end. I highly recommend using crochet cotton. It wears like iron, handles the constant twisting and untwisting well, and makes a smooth start to your yarn. (It’s even better than your handspun or commercial knitting yarns.) You can find it cheaply in the yarn section of most craft stores. Cut a length of crochet cotton approximately 3 feet long. Fold it in half – you should have one end with a loop and one end with two tails. Pass the loop under the bobbin, and then take the tail end up and over the bobbin and through the loop. You just formed a slip knot; cinch it down around the grooves in your bobbin. (If you have a smooth bobbin, cinch it at the end you prefer.) This slip knot will tighten up when you place tension on the leader, keeping it in place when you start to spin. 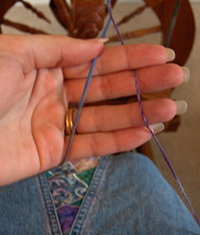 Now form a loop several inches long by knotting the two tail ends (treat them as one string). You’re ready to begin. Your singles can be any fiber and any weight, but both need to be spun in the same direction. If you don’t have suitable singles on hand, go spin some now. It’s much easier to work through the tutorial with your hands on your wheel. Spin up a small amount of fiber to ply and use as a reference sample for later if you don’t have the patience to fill your bobbins. I use both hands to ply. This helps maintain an even tension on both singles at all times. 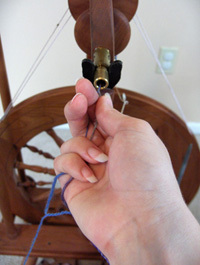 Maintaining even tension is key to plying a smooth yarn. My right hand is my forward hand, but you can use this method if you use your left as your forward hand – just do the opposite of the pictures. Place your kate under your chair (or even farther behind you if you prefer) with one single on each side of your lap. If you’re working with center pull balls, place one ball on each side of you. Keep them even with your thighs so you can deal with any tangles that might arise. Pass about 1” of each single through the leader loop. Start spinning in the opposite direction the singles were spun in. Spin slowly for about 2 feet. Then allow the yarn to wind on. Place your singles in your forward hand, across your palm, with your pointer finger sticking straight up into the air. The right single should flow past the right side of your pointer finger and the left single should be to the left of your pointer finger. Now close your fingers lightly around your hand. Your pinkie and ring finger should apply slight pressure to the left single, while your thumb applies pressure to the single by pressing gently against your pointer finger. This is a side view of the forward hand closed. Arrange your back hand in the same way as your forward hand, holding the singles just behind your forward hand. Depending upon conditions, your back hand may not apply much tension at all, but it will prevent the singles from tangling together as you ply. It will also assist the singles, should they get momentarily stuck. This happens more in humid conditions, or if you are plying from center pull balls. To ply, your back hand will stay stationary over your lap. Your forward hand will move back and then forward as you ply, wind on, ply, and wind on. Your forward hand should start near the orifice, your back hand near your waist. 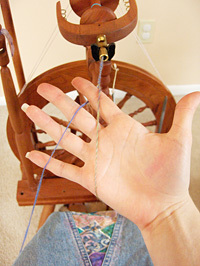 Gently, with even pressure, pull your forward hand back as you start to treadle. 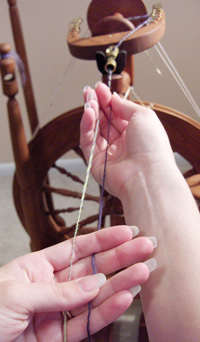 Your aim is to coordinate the speed of your hand with the amount of twist entering the yarn - the smoother the better. When your forward hand reaches your back hand, pinch the singles hard, so that no more twist enters (keep treadling) and move your hand forward so the yarn winds onto the bobbin. Repeat until you’ve plied your bobbin full. 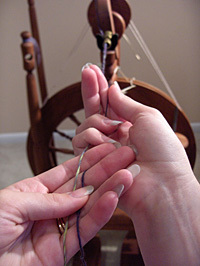 As you get better at plying, you may find that closing your fingers around the yarn creates too much tension. This is especially true if you’re working with lightweight singles. Feel free to open your hands, and only apply light pressure with your pointer finger and the two adjacent fingers. Twist is what holds a spun yarn together. Technically speaking, the friction and energy placed into the yarn by twist is what holds all the fiber together, but weíre really not going to go there. I’ll hit the highlights of twist, and if you’d like more info I highly recommend the Big Book of Handspinning by Alden Amos. Whether you love or hate his opinionated style, you won’t lack for information on how twist influences the final yarn. What gauge is to knitting, so twist is to yarn. The amount of twist you put into a bunch of fibers is going to influence its final length, tensile strength, durability, and feel. With too little twist, your yarn will lack the friction it needs to hold together. Add too much and you’ll find your skein to be a wiry, coiled, mess that knits up as softly as wire. Often twist is measured as Twists Per Inch or TPI. To find a yarn’s TPI, simply count the number of twists across a known length. It’s better to measure over more than a single inch, and divide to find the average TPI; just like you measure the number of stitches across a 4 inch gauge swatch rather than over a single inch. TPI is directly affected by how frequently you treadle as you draft. The larger your whorl, the fewer twists per inch you’ll add per treadle. 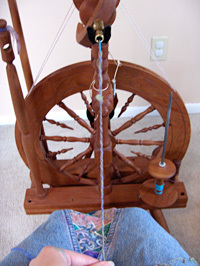 Most spinning wheels add more than a single twist per treadle. You can increase or decrease your TPI by speeding up or slowing down the rate at which you treadle. It’s really hard to count the number of twists in a single by sight, and I have better things to do with my time than squint at my yarn as the minutes tick by. I suspect you do, too. It’s far easier to pull out 18-24 inches of freshly spun single, and ‘ply’ it by allowing the single to twist back on itself. Then simply count the number of ‘bumps’ in the yarn over 2 or three inches. Each bump corresponds to a single twist. Divide your total bumps by your total inches, and you’ve successfully measured the TPI of your yarn. Feel free to use any unit of measure that’s familiar to you. TPC or Twist Per Centimeter is just as useful as TPI. If all that counting is driving you batty, then grab your protractor and check out this article by Pippi. You can use the self ply method to check the twist angle, which is another way to measure the amount of twist in your yarn. Keep twist in mind as you spin your singles and embark upon the adventure of plying. Spin up several sample skeins, with different TPI. Attach a tag, and place them in a notebook for handy reference later. A little experimentation with twist will make you a better spinner, and give you more success in your hand spinning endeavors. There are a few finer points to plying which make the overall result much better. First off, you need to control the amount of twist going into your yarn. You may not ply the entire skein in one sitting, and even if you do ply all at once, there can be variations along the length of the skein. Measuring the amount of twist that goes into the yarn and keeping notes is one of the best things you can do for the quality of your yarn. Keep your chair the same distance from the wheel. Before you start spinning in earnest, get comfy with enough room to ply but not too much that you have to bend or stretch to wind on. 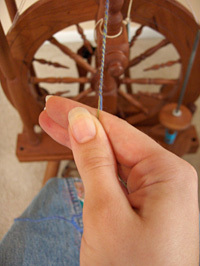 Very often you’ll sit slightly farther away from your wheel while plying than you would while spinning singles. Record this distance on your note card, in case you don’t get it done all in one shot. You don’t need to measure with a tape, just jot down a good estimate of the distance so you can set it up again if need be. Resist the urge to pull out really long lengths of singles while plying. Instead aim to pull out comfortable lengths of a consistent distance. The yarn will be more even and you’ll tire less quickly. 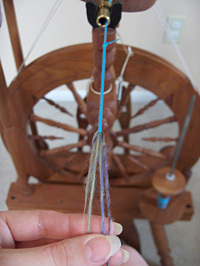 Setting the twist is an important step in spinning that often gets overlooked. It improves the yarn by deactivating the twist energy in the yarn from spinning. Deactivating the twist will help prevent twists and tangles of an active yarn during ball winding and knitting. It also reveals the true nature of the yarn, and you can avoid surprises after your finished piece is washed. You must set the twist before determining whether or not you have a truly balanced skein. Unset yarn behaves differently than set yarn: always set your twist before evaluating a skein for balance. To set the twist: tie your hank loosely with waste yarn or string in 3 or 4 places. Fill up a sink or large bowl with hot water: as hot as you can get from the tap. Submerge your skein, pressing out any air bubbles. Make sure it’s thoroughly wet. Leave your skein in the water for 5 minutes or longer. (I’ve been known to forget mine for several hours; it really doesn’t make a difference.) Gently wring out your skein and hang it to dry. Your twist is set and you’re done! 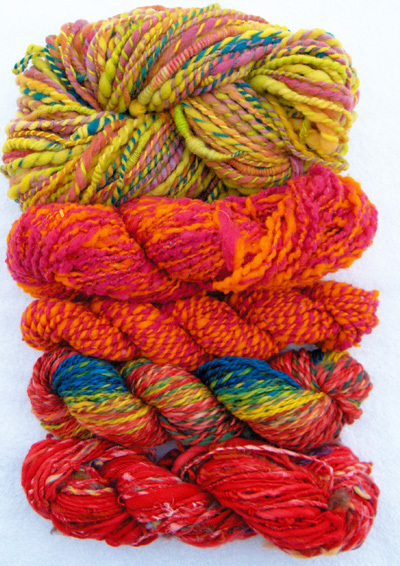 Enjoy knitting up your beautifully plied yarn. Katie lives at the edge of a field in central Iowa, where the spectacular colors of the setting sun on the verdant fields nearby often provide inspiration for her yarn dyeing. She spends her days raising her three children while cramming dyeing, spinning, and knitting into every free moment. You can see her color sensibilities on display at Yarn Love.